A 21-year-old senior studying electrical engineering at South Dakota State University, Dan has an Extra class amateur radio license, and he helped his younger brother to also become licensed. He is a past president and current member of the board of directors of the Le Mars Community Amateur Radio Club, and a member of the Brookings Radio Research Club. He is interested in home-brewing and has constructed three 2-meter repeaters from Motorola surplus as well as antennas and other items. 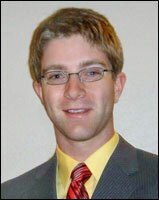 Dan previously received $1,000 from RCA for the 2006-2007 academic year. For the 2005-2006 academic year, Dan received the $1,500 Jacobson-Kelleher Memorial Scholarship from the Quarter Century Wireless Association in a program administered on QCWAs behalf by FAR. Also for the 2007-2008 academic year, Dan was selected by the ARRL Foundation to receive a $1,000 scholarship grant named in memory of the late Richard W. Bendicksen, N7ZL. The ARRL Foundation previously selected Dan for the 2005-2006 academic year to receive the $1,000 PHD Scholarship Award, named for the PHD Amateur Radio Association of Kansas City, Missouri. The PHD club was dissolved by a vote of its members several years ago. Thank-you to Diane Zimmerman, AA3OF, chairman of the FAR Scholarship Committee, which administers three of RCA’s scholarships. After FAR announced the scholarship winners, she provided me some information about Dan. This entry was posted on Saturday, July 21st, 2007 at 9:15 am and is filed under RCA news. You can follow any responses to this entry through the RSS 2.0 feed. You can leave a response, or trackback from your own site.